ASP.NET DataGrid allow us to provide in-line editing of rows. However, there is no built-in way to add a row. One solution many programmers follow is to add a new row in underlying DataTable and then bind the DataGrid again. This trick does work well but needs some validations on the DataTable before updating. If not tested for all possible user actions the DataTable may contain unwanted empty rows. 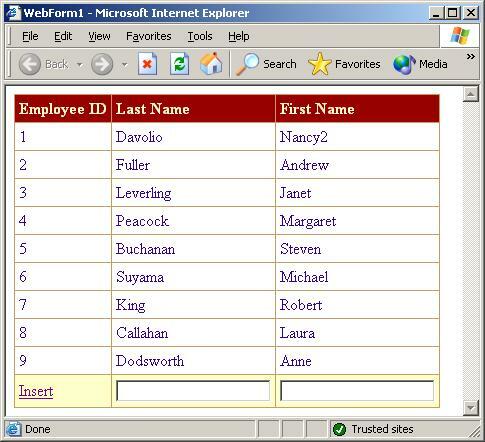 Alternative to this is to make use of DataGrid footer template to provide empty data entry controls to the user. This is not only a quicker way to add records but also avoids need of strong validations that are otherwise required in former technique. To provide the user with a blank data entry row, we make use of DataGrid�s footer template. We add TextBoxes directly to the footer template. This makes it unnecessary to click on some button like "Edit". This also reduces number of post backs. We also add a LinkButton (Insert) and set its CommandName property to "Insert". This CommandName is used inside the ItemCommand event handler of DataGrid to ensure that record gets added only when user clicks the Insert LinkButton. The code to add the row in the database is the typical code and needs no explanation. Sample code is available with this article for downloading that provides you with a fully functional example.